"City Suicide" is quite big city/desert level with many different locations. Your journey begins from a street, you'll proceed to some hi-tech base which later leads you to a big canyon area and after that you'll find yourself standing in the middle of a city street. Design is at times above average and at times below it - mostly average. Shadows are sometimes very good, wide & dark (canyon area is very good looking) but sometimes there are missing light sources and rooms which are just too bright (like that generator/hi-tech area near the beginning with slime etc.). Sometimes locations are too small (stairwell near the beginning & one elevator) or empty. I also didn't like the way the author used sprites as locked doors in that underground storage area. Like I said - some of the areas look good. 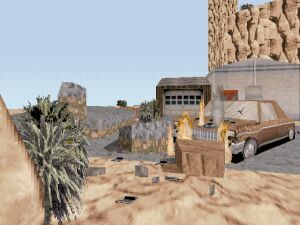 The canyon area with good shadows and debris on the streets with crashed cars & fire all look good. Also the cave which leads you to a teleport is well designed. There are some typical beginner flaws all around the level but nothing too bad - only the kind of things you can fix easily. Monster/weapon balance is good and the level has a lot of fun to offer. Definitely worth your time.